My family history research started in the 1990s, and has been massively affected by changes in technology. The most dramatic change came when it became possible to trace ancestors through genetic DNA testing. I always had a suspicion that there was something wrong in my family tree, but nothing definite. I gradually became more suspicious as more matches piled up on my mother's side, but none on my father's. Eventually I asked the closest family member on my father's side to take a DNA test. This showed that where there should be a better than 99% match there was nothing. Then after a few weeks my relative received a good match to an internet acquaintance who I had established from the records was a more distant family member. Where does that leave me? My dad is still my dad, just not my father, and my loving memories aren't any less . My dad's family are still my family, just not related to me. Apart from changing a few occurrences of ' father' to 'dad' my original page is correct. 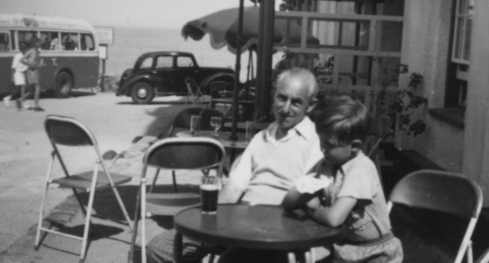 Appropriately it starts with a picture of me and my dad on holiday in Jersey. This page includes references to several villages in three counties - most of them are in fact within a circle of twelve miles centred on Merstham, seventeen miles due South of the centre of London, now at the junction of the M25 and M23 motorways. Hever and Chiddingstone are about twelve miles to the south. I have made reference on my family history home page to the possibility of a link between my family and the famous family of bankers. as this is pure conjecture I will try hard to stick to the facts on this page. My thanks to Tony Moreton, who has added substantially to my understanding of my earlier ancestors. My line as I know it starts with Edward HOARE, born in around 1760, in Chiddingstone, Kent. Chiddingstone is an attractive small village with a long history. The main notable feature is Chiddingstone Castle - as so often not really a castle, but a grand country home. Chiddingstone is a mile or so from Hever, another small village with a very similar castle. Edward married Mary Banister, née Knight, in 1787. 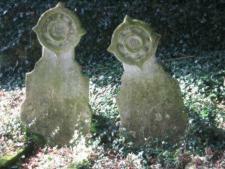 Edward had three children; Richard and Mary, both baptised in 1788, and my ancestor Edward, baptised in 1790. 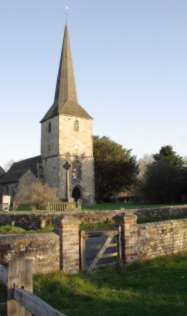 All three children appear in the Parish Baptism records for St. Peter's, Hever (picture left) but interestingly Richard along with quite a few other entries is recorded as having been baptised privately and introduced into the Church. Baptism outside the Church usually indicates that a child was born sickly, but it is possible that these 'privately baptised' children were baptised in a chapel either in Chiddingstone Castle, or Hever Castle. Edward married Elizabeth ELIFF in 1812. Elizabeth came from Godstone, where her family leased Flint Hall from the Clayton family. (Flint Hall farm, which still exists, was run by the family), but they were married in Saint Bride's Church Fleet Street in London. Saint Bride's is known as the printer's Church and is famous for its connection to newspaper publishing, but the reason that the marriage took place there was that Elizabeth's father Jeremiah was an attorney at law working at the Royal Courts of Justice in Fleet Street, with chambers at the Inns of Court. (It was also the local church for the Hoare family of bankers, but I mustn't allow conjecture to carry me away!). Edward and Elizabeth had six daughters and four sons, and by 1841 they were tenant farmers occupying Chaldon Court farm, opposite St. Peter and St. Paul's Church, in Chaldon, Surrey, a few miles away. Edward died in 1870, aged 80 but Elizabeth carried on running the farm, assisted by three of her daughters who hadn't married. Their graves can still be seen in the graveyard. The name 'Edward' has now been carried in the family in an unbroken line for eight generations; I just mention this in case my sons should read this! It just, so happens that the Bourne Society - England's largest local history society (allegedly!) - has a book about Chaldon as number 7 in its Village History series. Amongst a huge amount of local information it includes maps showing Chaldon Court farm, as well as information on the farm building, which is of great age and considerable historical significance. As if this wasn't enough, there is mention of the Hoare family, and a reproduction of their entry in the 1841 census! Chaldon Court was first built in about 1330. It is still standing, having recently been converted to flats. The farm is also still operating. The farm and buildings, like most of the area, were owned by Lord Hylton. Because of this, farmers tended to move on, and in fact the Hoare family is mentioned as being the only farming family to be recorded as living in Chaldon from the 1841 census to the 1881 census. The Bourne Society publication Village Histories 7, 'Chaldon', is available from GENfair. Some of their other publications carry more material relating to the village and farm. Chaldon Court Farm has also been visited by Niklaus Pevsner and appears in his Surrey book - PEVSNER: Buildings of England, Surrey (1971) p.141. I haven't yet seen this. Edward's first son was Edward, born 1816. He married Emily Tidy, a farmer's daughter from Rusper in West Sussex, in 1839. The family lived in Merstham, but farming was becoming more and more difficult, and some time before 1845 with two young children they joined the general exodus from the country and moved to London where they had two more children. Edward seems to have turned his hand to an assortment of trades; butcher in 1851, commercial clerk in 1861, clerk whiting and manure in 1871 (whiting is apparently processed chalk, used industrially), dealer in works of art 1881. He was still in London in 1891 as a pensioner, and died around 1898. Edward's sister Emily married Edward Tidy, with the result that Emily Hoare became Emily Tidy and Emily Tidy became Emily Hoare! Edward's first born was - Edward! born about 1839. He grew up and was educated in St. Marylebone, London. By 1871 he was a shopman and corn dealer. I can only guess that Edward met his future wife Angelina Crux in the course of business. The Crux family date from the twelfth or thirteenth century and can be traced with some certainty from 1468. By 1864 Angelina's father Henry owned the mill at Appledore in South Kent, but times were hard, the mill was in poor repair, and he had only daughters to help him with the hard physical work. He moved to London where he could use his knowledge of milling in work as a grocer and baker. Edward and Angelina were married in 1875, and I have found only one offspring, (another Edward of course! ), born a year later. By this time Edward was landlord of the Railway Tavern, in Deptford and in 1881 he was a licenced victualler in Shoreditch. By 1891 Edward was working as a rent collector, with his address as 'the office, Marshall Buildings'. However, by 1901 he was a 'dealer in works of art'. This was shortly after his father died, so perhaps he took over the business and its assets. 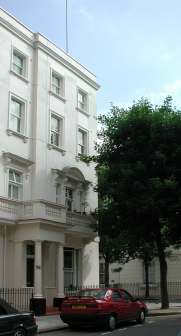 By all accounts he was living in a large and apparently high status house in Pimlico (pictured right), although the records show that his family only occupied one floor, and most of the residents were in fairly ordinary occupations. The next Edward was in fact Edward Henry, my grandfather, born late 1876. I know less about him than his predecessors. He married my grandmother Florence Bell in a register office in May 1901, and my father was born five months later. In the 1901 census Edward was living with his father; Florence was shown as 'visitor'. She added a year to her age, being actually only seventeen when she married. I have no real idea of how Florence, a country girl from rural Hampshire, came to be working in London. She came from a large and poor family, so she may have been put into service. At the time of the 1901 census the Hoare family had a maid by the name of Emily Horton, from the same village as Florence. Florence had a sister Emily, born the same year as this Emily, so it is at least possible that Emily had married and been widowed, and was in service in London, and Florence came to visit and thus met her future husband. The family story is that Florence first worked for a vicar in Birmingham. She told me that she had been a nurse and wetnurse in the poorest areas of London. (Of course, she wouldn't have been qualified, and was barely literate). Edward Henry seems not to have done much in life; he was a warehouse clerk in 1901, and according to the family he at one time worked in one of the large London stores. I believe he died in the thirties. My dad was Lancelot Edward Hoare, born 1901 died 1957 and still sadly missed by me. He is pictured at the top of this page and wedding picture of his marriage to my mother Vera heads my main family history page.